This vivid and colorful invitation is sure to grab your guests' attention! The top of the invitation showcases a vibrant photo of a purple and yellow flower on a black back drop with drops of dew resting on its petals. 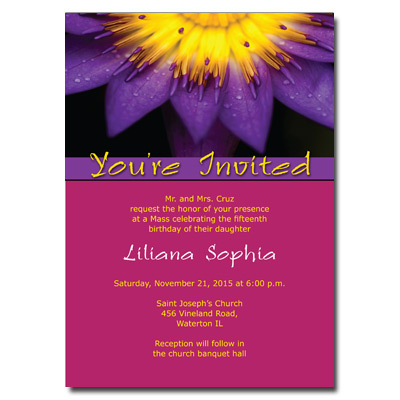 Your event information is printed in yellow on a fuchsia background with your daughter's name in white. Card measures 5 x 7.